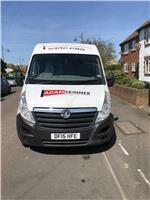 Adam Skinner Carpets and Vinyls - Carpets/Flooring based in Bognor Regis, West Sussex. Hello my name is Adam Skinner and I am a local Bognor Regis based independent floor layer. I started my carpet fitting career 17 years ago doing work experience with a local carpet shop. From there I went on to learn the trade working with most of Bognor’s carpet shops at different stages, and then back in 2006 I went self-employed on my own with a van, sub-contracting to various carpet retailers. Over the last 15 years I have picked up many of my own customers gradually getting busier and busier to the point where I was struggling to subcontract to company’s and cover my own work. Of course my own work and customer base was my priority so the beginning of the year I left the sub-contracting work to become and work solely on my own starting Adam Skinner carpets and vinyl’s. I’m a sole trader running my company myself, along with my trainee apprentice. I have low over heads, no shops etc. it is just me, my unit and my van and trainee so price wise I will always be your cheapest quote. I offer many carpets and underlays at wholesale prices, I never charge for gripper rods or door bars allowing you as the customer to buy your flooring at trade price. We move all of your furniture and re-install it completely FREE of charge with no limit of items per room!!! I uplift and dispose of all your old flooring FREE of charge!!! allowing you a complete stress free installation. I am the face you will see from the start of a phone call to book a home visit, to myself coming to fit your flooring, I strictly use no third parties i.e. estimators, fitters etc. Always feel free to call for free friendly advice, I also have a mobile showroom with 100s of carpet and vinyl samples to suit all budgets. Many thanks for taking your time to read Adam. All West Sussex-Bognor Regis -Chichester-six villages-Littlehampton-all Hampshire-Portsmouth-Southampton- all east sussex-Worthing-Brighton -Pulborough-mid Sussex-Horsham-Crawley -London.